Organize your bag to avoid clutter. With as many as 14 golf clubs, a golf bag can get very cluttered in a short amount of time if it is not loaded correctly. Not only will it look better and be easier to carry--there are still many golfers who carry their own clubs as they walk an 18-hole round--it will help you find the clubs you need much quicker if it is loaded correctly. In addition to your clubs, you may want to carry accessories, balls and emergency sustenance in your bag. Load your woods in the top section or sections of your golf bag. 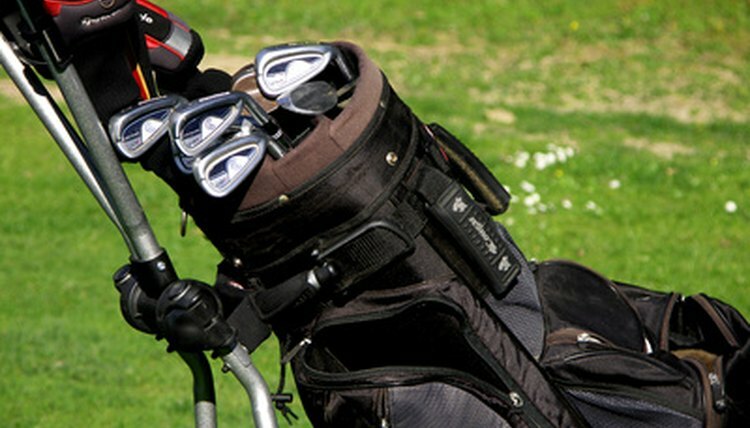 Nearly every golf bag is divided into at least three sections when looking at it from the top. The top section, or sections, should be for your driver, 3-wood and 5-wood. If you happen to be a golfer with one or two additional woods they should also go in this section. Put your long and middle irons in the middle section of your golf bag. They comprise the 3- through 8-irons. Bags with four sections with have two middle sections. In this case, put half of your long and middle irons in one section -- say, 3- through 5-iron -- and the other half in the other section. Put your short irons in the bottom section of the bag. The short irons include the 9-iron and wedges. If you carry just two wedges, you may want to add your 8-iron to this section. Place your putter in the top section along with the woods, in the bottom section with the short irons or in a special slot along the side of the bag designed for this purpose. Place your golf balls and golf tees in a zippered pocket at the bottom of the bag. In another zippered pocket you may want to keep a sandwich (you may get hungry while you play) a bottled drink and sunscreen. If you have a golf umbrella, place it in the section of your bag with the woods and the putter or in the the slot designed for this purpose along the side of the bag. How Do I Load a Golf Bag?